Sarah and I frequented He’s Not Here every Friday night. I wasn’t a fan of the place but ever since she’d met this water polo player, she’d been on patrol for him. The guy had asked for her phone number, but she hadn’t had a pen and by the time she’d borrowed one, the guy had left with his buddies. So, we staked out the front table and nursed our drinks from eight until eleven every Friday. “Why don’t you just find out his name and call him.” I chowed down on the pizza we’d ordered, also part of our Friday night routine. “I tried that. But none of them were him.” She looked over my shoulder to check out the latest patrons. Her eyes drifted back to mine when she’d inspected and rejected. “Wait. What? He told you he was a water polo player and now you tell me that was a lie?” Gah! Why couldn’t she take her licks and say, ‘I’ve been had’ and move on? “Right…” I gave up arguing with her and dug into my pizza and beer. At nine thirty, HE walked in. Not Mr. Phantom Water Polo Player, but Mr. Physics Grad Student. I’d seen him on campus before, always with a serious look on his face, an overstuffed backpack on his shoulder. His clothes had a devil may care appearance to them and best of all, he was alone. I kicked Sarah under the table and nodded with my head. I grimaced. It was one thing to egg Sarah on, but quite another to have to be the brave one. My throat constricted and I swallowed hard. I couldn’t choke now. I stood and followed him as he winded his way through the bar. He passed several empty tables and kept walking. Where was he going? To the men’s room? No, he already passed the turn. I stopped and turned back to see Sarah flipping her hand at me in a waving forward motion. Her lips formed the word “Go”. When I turned back around, HE had stopped at the “Wall”, so-called because it was a popular spot for students to post items for sale, to find rides, apartments, roommates, lost puppies. Anything and everything was fair game for posting on the wall. I watched as he withdrew a sheet of paper from his hip pocket, unfolded then tacked it up. Rather than retrace his steps through the bar, he ducked out the back door. I’d lost my chance unless I lowered my pride enough to chase after him. Instead, I closed the gap between me and the Wall and found what he’d posted. Back at my table, I shared my near miss with Sarah. I didn’t tell her about the note because I knew she’d insist that I call sight unseen. For the next hour, we drank our beers and chatted up a couple of fellows who joined us then left disappointed that we weren’t as easy as they’d first assumed. “Off to the ladies room,” I announced at ten-thirty. Only another half hour to go. I passed the turn for the bathrooms and walked to the wall instead. I read the sheet. Someone had written below my message. “Take a chance and call the guy. Don’t be so shallow.” Who’d done that? I withdrew my pen and added, “Not being shallow, just cautious. If the man who posted this is the author, I REALLY want to meet you.” Pen recapped, I be-bopped off to the bathroom. I growled and wrote: “For your information, I’ve been coming here to keep a friend company, not for my own prowling purposes.” Whoever kept writing on my note was starting to tick me off. I decided to fall back, somewhat out of sight. I saw the back of his head first. It was HIM. How he’d managed to keep slipping in unnoticed befuddled me. He paused at the wall for a moment, then started writing. Before he could escape, I closed the distance and read what he wrote. 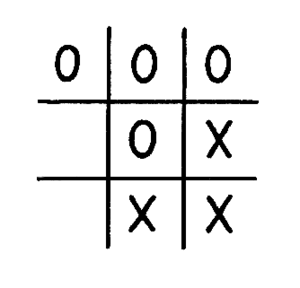 I drew a tic-tac-toe grid, and added an X in the lower right corner. He reached over and added an O in the center. Back and forth we added X’s and O’s until the game ended in a draw. “Now what?” I wrote. The man and I looked at each other then nodded. He trotted off into the bar’s kitchen. That explained a lot. I headed back to my table. “What took you so long?” Sarah asked. Outside, I paused and took in the cool February air. Sarah found her car and drove off with a wave. I pulled out my cell phone and dialed. ‘Danny’ answered on the first ring. “Hi, I’m the girl in the red Disneyland jacket,” I announced in a rush of breath. We flipped our cell phones closed at the same time and smiled at each other.